Pots of soft, rindless goat’s cheese are the ones to use here. The taste is subtle and creamy, and it goes brilliantly with the slightly bitter flavour of spinach. 1. Sieve the flour and a good pinch of salt into a bowl. Add the butter and rub into the flour until the mixture resembles fine breadcrumbs. Add about 2 tbsp ice-cold water and stir it in, then use your hands to bring the mixture together and knead it gently into a ball of dough. You can also do this stage in a food processor, adding the water then whizzing it in. Just tip the mixture into a bowl and bring together with your hands as before. Wrap and chill for 15 minutes. 2. Roll out the pastry thinly and line a loose-bottomed 21cm, deep fluted tart tin. Chill for around 15 minutes. 3. Preheat the oven to 200°C/180°C fan oven/gas mark 6. Line the pastry case with greaseproof paper and baking beans and bake blind for 10-15 minutes or until the pastry feels just dry. Remove the paper and beans and return to the oven for a couple more minutes until completely dry to the touch. Reduce the heat to 180°C/160°C fan oven/gas mark 4. 4. Heat the oil in a frying pan and gently fr y the spring onions and thyme leaves until softened and beginning to colour. Add in the spinach, then season and stir until just wilted. Remove from the heat. In a bowl, whisk the crème fraîche with the eggs and season well. 5. 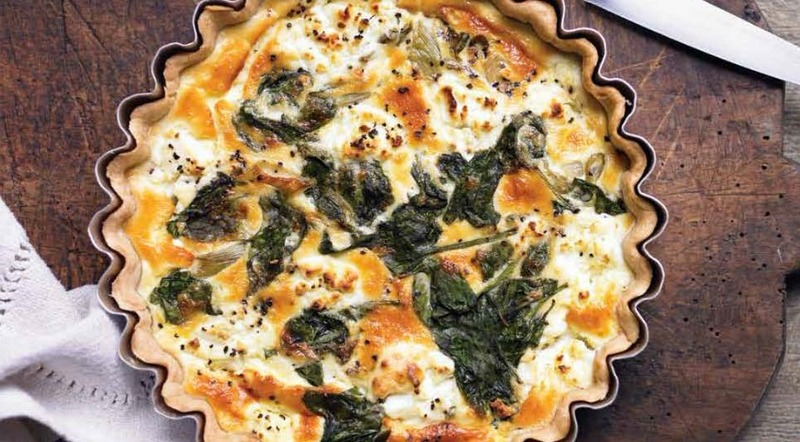 Arrange the onion and spinach in the base of the tart. Pour over the egg mixture. Spoon little dollops of the cheese evenly over the top. Bake for 25-30 minutes or until just set. 6. Turn out and serve warm or cool with a crisp salad. If you have any nutmeg in the cupboard, add a good grating to the spinach as it wilts in the pan.